A barometer is a device for measuring atmospheric pressure. A core part of most barometers is a sealed capsule filled with gas. It is called an aneroid. To use the device is very simple, just look pointing arrow. Barometers can be aneroid and mercury. The word "aneroid" means "basiccally". 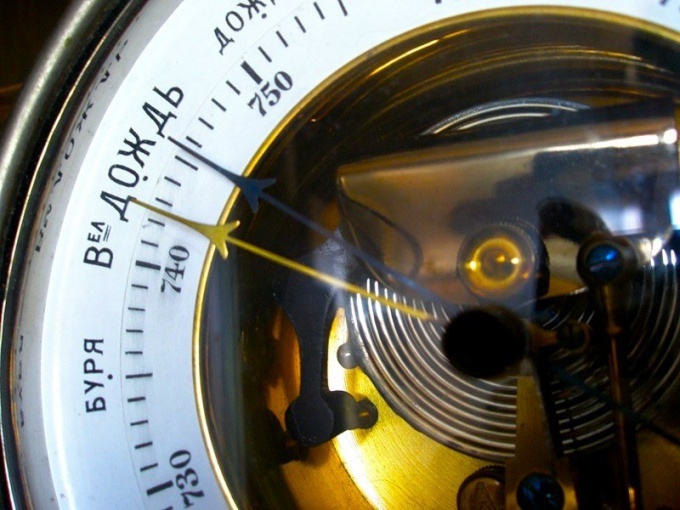 The principle of operation of such a barometer is quite simple: changes in atmospheric pressure lead to changes in the geometric dimensions of the aneroid, in result, the arrow on the scale moves. These barometers do not contain hazardous elements, therefore, are suitable for use in the home, in terms of Hiking. In addition to the aneroid, and mercury there are devices for measuring atmospheric pressure used mercury. Under the action of atmospheric pressure changes the height of the mercury column. The indications of the barometers are more accurate, such devices are used at the meteorological stations. Mercury and its vapors are dangerous to humans, so such devices do not use at home. You can find electronic barometers, as a rule, they are part of home weather stations. Such integrated devices also measure several other quantities (e.g. temperature and humidity) and allow you to fairly accurately predict the weather for the near future. Digital devices are less sensitive to shaking, so it is good to use in cruising. To use the aneroid barometer easy. Need to see what value the arrow is pointing to the device. On the scale of the barometer has zones that are designated as "drought", "clear", "variable", "rain", "storm", as well as the division showing the absolute values. If the pressure is reduced precipitation, if increased, will be clear. As a rule, the barometer has two hands - one moving, it is connected with aneroid capsule, and the second can be rotated. If it is aligned with the arrow indicating the magnitude of the atmospheric pressure, after some time, it is possible to observe in which direction to deviate the movable point. Normal atmospheric pressure is 760 mm Hg. article when the air temperature is 15 ° C, the so-called sea level. Homemade barometers can measure its value in the range of 700-800 mm Hg. article on not more than 300 m above sea level. Falling pressure indicates deteriorating weather conditions, the approach of rain or snow. Areas with low pressure are called cyclones. Anticyclones are areas with increased pressure, their approach means the arrival of good weather. Barometer set up, if his testimony differs from the testimony the local weather station is more than 8 mm Hg. art For these purposes, provided the adjusting screw located in the rear of the case. When setting up you need to turn it at the angle not more than 45 degrees.